Testimonies ‹ Rovey Banquet Services Inc.
Just wanted to thank you and Roger again for all your assistance in making Mary-Ann & Imran’s wedding a huge success. I know it has been quite an experience leading up to the wedding and we are very grateful for your assistance and patience along the way. Everybody is still talking about how great the food & service was! Nobody went home starved. It has definitely been a pleasure working with both of you and I look forward to working with you again in the future. After attending 2 weddings catered by Rovey Catering, my husband and I were impressed and decided to employ their services. We got married June 27, 2009 at Grand Baccus Banquet & Conference Centre. We had approximately 305 hundred guests at our reception. Not only did Rovey Catering cater our 10 course meal, they also arranged the standard decor (table linens, chair covers and etc) for us. They provided us with a vendors list where we got our DJ, MC, and Audio/video tech from, all at a very good price. Our primary contact was Harvey Tam. Harvey was very professional, organized and responsive. My husband and I were very behind in our planning and all over the place when it came to the reception timeline and details. Harvey basically stepped in and was able fix everything for us and even implement all my last minute changes. The day of the wedding, he had everything under control and all went well. My husband and I highly recommend Rovey Catering – you can’t go wrong. Best of luck in the planning of your wedding! I normally don’t write reviews but feel like Rovey Catering has done such an amazing job at our wedding that I must share this experience with future brides. Harvey’s team was phenomenal at our wedding. The service was excellent and all the guests were very pleased with the quality of the food. Not only did they provide excellent food and service, but Harvey went out of his way to help us as much as he can. He agreed to help us take down our DIY chair covers at the end of the event, which was such a nice gesture to help ease the workload of our happy but tired wedding party! Harvey also gave us great advice along the way throughout our planning process- from helping us save money in areas possible, to advising meal options for our guests with allergies. All in all, we could not be more pleased with Rovey Catering. And like the other bride in this review section, I echo of not regretting spending the extra money to have Rovey Catering cater to a Western banquet hall. It is really the best of both worlds and guests will continue to talk about it for years to come! 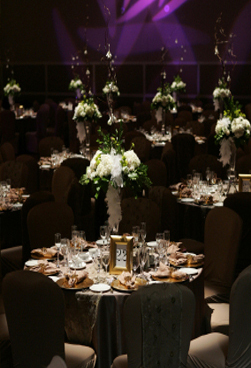 When we booked the Eglinton Grand for our wedding venue, we were tempted to serve our guests a Western dinner rather than pay extra to have Rovey Catering provide Chinese catering. However, after much consideration, we realized that nothing would please our parents more than to have a traditional Chinese wedding banquet dinner. We decided to offer our guests the best of both worlds: a gorgeous venue & traditional Chinese menu. It was the best decision we made for our wedding. The catering provided by Rovey Catering was superb. The service was fast, efficient, and professional. The food was cooked on site and was EXCELLENT. (In truth, it was much better than many other Chinese wedding dinners we have had that were served at Chinese restaurants or halls.) We received so many compliments from our guests, both young and old, Chinese and non-Chinese, about how good the food was at our wedding. Our parents and older relatives were truly impressed. The catering manager Joe, was efficient and prompt and even checked-in with my mom a couple of times throughout the evening to make sure that the food and service were up to her expectations. For future brides and grooms facing the same dilemma that we did, I would highly suggest having both a gorgeous banquet hall and excellent Chinese food catered by Rovey Catering. It’s all that your guests will remember and you won’t regret it. Rovey Catering catered our wedding at Atlantis this past weekend. Harvey and Roger were phenomenal to work with. They were very patient and thorough in answering all of our questions. We had guests with some severe food allergies and they were very accommodating in putting together special meals for these guests as well as for the kids. They were also very understanding in dealing with the last minute changes we had. At the wedding, Harvey and Roger were both present to coordinate everything from ceremony to the cocktail reception to the dinner to serving the cake at the sweets table to the clean up at the end of the night. His staff were extremely professional and expedient in their service. Our guests all thought the food was delicious! We truly believe that Harvey and Roger went above and beyond their role to make our wedding a huge success. Our wedding banquet was at the Ontario Science Centre. Our decision to use Rovey was pretty simple – if we wanted Chinese food, Rovey/Rovey Catering were the only caterers the venue trusted and would allow us to use. We found this to be the case with other high end Western style venues. Harvey and Roger were great from the start, beginning with a high level framework with what needed to be done and what it could cost. From there, they executed the plan paying meticulous attention to detail. Throughout the process, they were accommodating and patient. The banquet went off without a hitch and they came through when it counted. Our guests had a great time and there were no shortage of compliments about the food. We had an amazing evening and couldn’t have pulled it off without these guys. Everyone at our wedding was very happy with the menu, quality of the food, and portion sizes. They are still talking about it. Rovey Catering is definitely the better choice for Chinese banquet catering in the GTA. The service provided was also exceptional, with a full team of banquet staff. Harvey and Roger were both great with directing service throughout the night. We highly recommend them. Our guests are still raving about the quality of food and service that Harvey and his team supplied for our wedding! Be warned that they serve the food French plated instead of the the traditional Chinese banquet service which allowed for better portion control. All the waiters were very attentive to our guests and kept on filling up the tea and the wine and not taking the dishes away too quickly. My biggest worry about having the food caterered at a golf course was that the food wouldn’t be hot. Was I ever wrong! Every dish that came out was hot and it smelled so yummy that it made us, the bride and groom, eat every single dish so that we wouldn’t miss. If I have another function, I would definitely contact Harvey again. We used Rovey Catering for our wedding and Harvey and his team were great. In the early stages of selecting a caterer, Harvey was extremely professional, knowledgeable and helpful – he’s worked around the city extensively and provided us with a lot of insight in planning our wedding and working with the venue. The food and service was excellent (everyone raved about the food and we were able to work with Harvey on customizing the menu for our guests) and we would definitely recommend and use Harvey and his team again. The venue was beautiful and for a Chinese menu they did a great job as the food was good. For Chinese banquet it would be recommended not to do a French style serving but to just have the dish placed in the centre and have the wait staff distribute to people who would like some so for those not interested in the food it can still be consume by others who do like the food. We were so glad Rovey, and Harvey specifically was involved with our wedding. Every step of the process was professional, reliable, reasonable. The start of the process he helped us find the best venue and we locked down the date. Catering cost a lot one of the biggest cost or wedding. But you can rest assured everything will be fine with Harvey. All the A+ venues only work with harvey. He comes highly recommended. We did Angus Glen. They love working with him. We were very very happy. A full hearted recommendation.